'Dirigo Black Velvet' ( John White, R. 1998). Seedling 93 B-B4-7. SIB (tetraploid. ), height 40-44" (107-112 cm), Early to midseason bloom. Very dark purple overlaid with velvety black sheen, Falls with prominent gold signal; style arms dark purple. 'Golden Edge' X 'Over In Gloryland'. 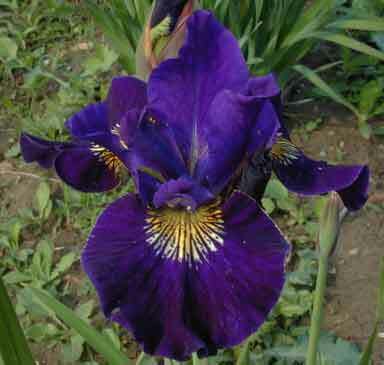 Pope's Perennials 1999.
jpg BHP_7500-X2_dirigo_black_velvet.jpg manage 227 K 20 Feb 2016 - 04:53 BrockHeilman Please contact Brock Heilman for image use.